- Workshops - thank you so much to those of you who turned up for my sessions at Sawtry and Ramsey! I had a fantastic time and really enjoyed meeting and talking to you all! - Chemical Blue - I am currently working on the epilogue of my original title, Chemical Blue. Hopefully Volume 2 will be ready in time for October Comic Con! - And last but not the least... 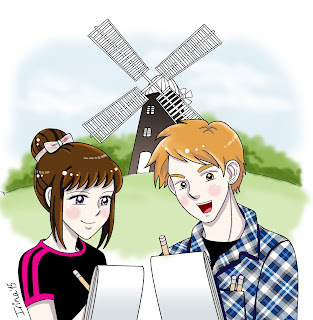 I will be teaching a manga drawing course at Burwell Museum during the school holidays, every Sunday from July 26th to August 30th! The course costs £35 for the entire duration and includes entry to the museum and refreshments in the tea room! There's more info on the Burwell Museum website. Please sign up if you're interested!